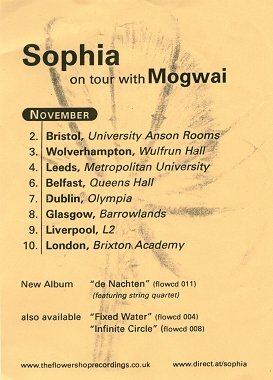 Sophia were excellent as expected. They're touring as a three-piece now: Robin on guitar and vocals, a bassist and a drummer. They started with a song I hadn't heard before called 'The Sea' and then played 'So Slow' and 'Are You Happy Now'. They played around four more songs, including 'If Only', 'I Left You' and 'The River Song'. Robin had to retune his guitar a few times and tried to pretend he wasn't usually in the band (he said he usually drove the van! ), and they'd given him a chance to play and he was really messing it up. Enter Sophia - three neatly presented young men who look so similar they could be brothers. Their opening line "We're Sophia, but she's sick so you're gonna have to put up with us" was delivered in such a deadpan American tone that as they nervously feel their way through the first couple of songs it was hard to figure out if he was joking or not. Their songs were slow and had that good old 'doom & gloom' feel. I could really believe their sincerity too as they sang "I'm only happy when you're sad" while the bassist stared into the void as though he was awaiting a dawn execution by lethal injection (I hear it's pretty big in the States…). Tuning was a problem for the frontman/guitarist/singer and he was clearly frustrated as he tried but failed to get his g-string in tune (a problem we've all had at one time or another…) but he eventually got it sorted out and admitted "I'm not actually a guitar player, I'm just a roadie but I've always wanted to be in a band…"